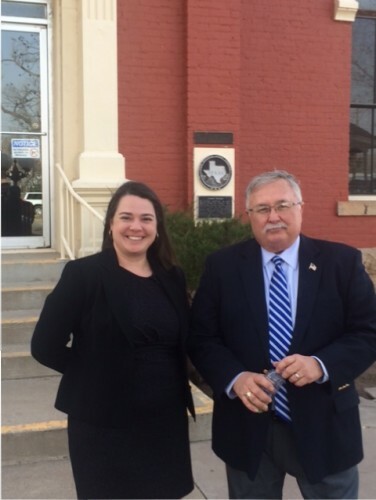 Prosecutors Kelly Bazie & Bill Parham, Brewster County Courthouse, Alpine TX, February 1, 2016 (Steve Anderson/KRTS). UPDATED February 2, 2015, 12:15 PM: McWilliams is sentenced to life in prison. A guilty verdict has been reached in the murder trial in Alpine. Keith Alan McWilliams has been convicted of murdering Walter “Trey” Sands on October 30, 2014. On Monday afternoon, it took the jury a little more than an hour to find McWilliams guilty of murder. In his closing statement, the defendant’s lawyer, Bart Medley, asked the jury to acquit on all charges. He spent most his time arguing the state had failed to prove his client had acted intentionally or knowingly. Medley claimed that if McWilliams was guilty of anything, it was only of manslaughter, which requires a finding of reckless conduct. Medley told the jury that while Trey’s death was a “tragedy,” it was the result of a “stupid, drunken fight that got way, way, way out of hand.” The jury clearly rejected that characterization. McWilliams cried several times during his testimony and said more than once that Trey was his friend. McWilliams showed no reaction to the verdict, but kept his head bowed as Brewster Sheriff Ronnie Dodson lead him away in handcuffs. Trey’s sister, Kara, reacted to the verdict with tears, saying that while justice was done, it wouldn’t bring Trey back. Decisions on punishment will be made on Tuesday. McWilliams faces 5 years to life in prison. This entry was posted in KRTS News and tagged alpine, Brewster County, Keith Alan McWilliams, murder, trial. Bookmark the permalink.